Inflammation is essential to the healing process — it is the body’s natural process to protect an injured area and supply vital nutrients and heat while the area recovers. Anti-inflammatory drugs, such as aspirin and steroids, may be actually counter-productive because they may interrupt the natural inflammation process — leading to incomplete healing. 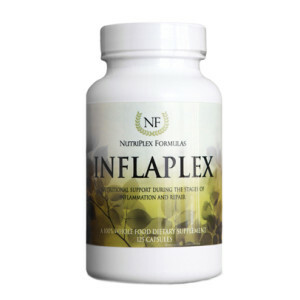 InflaPlex supplies the body with essential nutrients that it uses to assist the inflammation process, making healing faster and more effective. Excellent for healing, lung function, small blood vessel health, & more! Inactive Ingredients: Gelatin Capsule and Microcrystalline Cellulose. In addition to the unique properties, synergists and cofactors of this food, each serving provides the following nutrients contained within the above food-nutrient blend (not as isolates): Bioflavonoids (especially Rutin), Vitamin A, Vitamin B, Vitamin C, Vitamin E, Essential Fatty Acids, Iodine, Iron, Potassium, Calcium, Magnesium, Manganese, Selenium, Zinc, Phosphorus, Copper, Antioxidants, Trace Mineral Activators, Enzymes, Chlorophyll, Trace Minerals, Amino Acids, Phytonutrients, Chlorophyll, and more. 3 capsules, 2-4 times daily, or as directed by a healthcare practitioner. Not intended for pregnant or lactating women without consent of a physician. Inflammation is often accompanied by redness, swelling, congestion, pain, injury, illnesses, broken capillaries, bruising, etc. Inflammation is the natural tissue reaction to injury or insult — the succession of biochemical processes that occur in living tissue when it is damaged or impaired. Dead or severely damaged tissue cells must be engulfed, digested and eliminated as part of the healing process. Repair mechanisms must be initiated to replace these cells for proper healing. The processes of inflammation — the body’s attempt to repair itself — require a spectrum of nutrients in adequate amounts as well as sufficient nerve and blood supply. Certain food factors (in the foods listed above) supply support to immune system function, including the white blood cells, thymus gland, lymphatic system, vascular system, and more. Further, these foods support the natural process of inflammation and repair, rather than attempting to halt or delay this process. The natural unimpaired operations of inflammation are a marvelous system of biochemical stages designed to protect tissues, scavenge dead or foreign particles, and establish the matrix for cellular replacement.